Global Economic Concerns – At first glance, it doesn’t seem as though the economic conditions in China, Europe, Japan and other nations would have any effect on the United States economy. However, when you dig deeper, it becomes clear that just about every economy in the world relies on the stability of other economies around the world. Essentially, we live in a world fueled by imports and exports, and when one economy declines, exports to that economy tend to struggle. With that said, poor economic conditions around the world are taking a major toll on the US economy. Simply put, exports are nowhere near where they should be as China, Europe and more than 20 other economies continue to struggle! Since exports play such a major role in US GDP, this spells bad news for the economy. Jobs – A key factor when deciding how strong any economy might be is jobs. After all, when economies are doing well, corporations sell more goods and services. As a result, these corporations need to hire more employees to produce the goods and fulfill the services they are selling. Adversely, when an economy is doing poorly, it’s also seen in the jobs reports for that economy. As businesses start to sell less goods and services, they no longer need to hire and the amount of jobs added to the economy each month falls. That’s exactly what we’ve seen in the United States recently. When it comes to the US a healthy jobs report is considered to be any growth that is over 200,000 job additions per month. However, in the months of August and September, the economy added far less than 200,000 jobs. In fact, in these months, the US economy didn’t even add 150,000 jobs; proving to be a major cause for concern. Consumer Spending – Finally, consumer spending is the single largest figure in the GDP calculations for the United States. When the economy is doing well, consumers spend more money and we tend to see vast growth in this figure. However, throughout the year 2015, consumer spending has been growing at an incredibly sluggish pace. While strong jobs reports for the most part in 2015 have outweighed concerns with regard to consumer spending, now that job reports are proving to be negative as well, the consumer spending issue is starting to take center stage. Between these factors, it’s easy to see that the United States economy isn’t doing as well as we would like to see it do. As a result, the value of the USD has started to decline. Moving forward, I’m not expecting to see too much positivity out of the USD. Unfortunately, the economic issues in the United States are quite a while in the making. With that said, we can’t expect for these issues to solve themselves over night. In fact, I’m expecting to see a continuation of declines in the value of the USD at least until the end of the year. In early January I will reevaluate the situation to decide if declines are likely to happen further out as well. Where do you think the USD is headed and why? Let us know in the comments below! 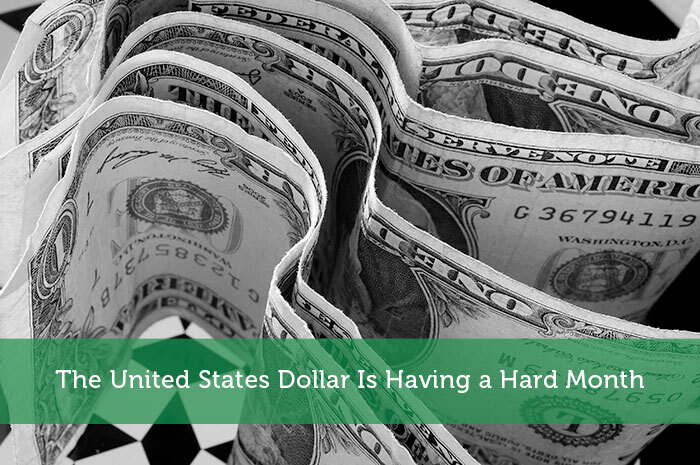 The question is whether this improvement in the US dollar can last. It is probably too early to tell, but I think that one bit of data does not change the concerning trend of weaker US data. I think the euro and dollar will be 1 to 1 in the next month. The question is how many month. USD looking good now against oil-rich countries like Colombia, where the peso just hit 3,250:1. Lots of buying opportunities for holders of USD now until mid-2016, I think.